What Is an MSHA-Approved Instructor in MSHA Part 48? In a recent post, we looked at the role of a “competent person” for the MSHA Part 46 training regulations. That was so much fun, we thought we’d expand the net and turn our attention to a similar (but slightly different) role in the MSHA Part 48 training regulations: the MSHA-approved instructor. It would be handy if the people who provide the mandatory MSHA compliance training for Part 46 had the same name for their role that the people who do it for Part 48 do. But, they don’t. And it would be nice if the rules for becoming a Part 46 trainer were the same as the rules for becoming a Part 48 trainer, but that’s not how it works. Sometimes life just isn’t as easy or fun as we wish it were. In related news, you can’t have your cake and eat it too, and you didn’t get a pony for your birthday. But, given that unfortunate news, let’s turn our attention to Part 48, see what’s what, and make life that one little bit easier. At least for those of us in the mining safety world. Convergence Training provides online safety training courses, learning management systems, incident investigation software, and contractor orientation solutions for mining safety and general safety. Explore the links below to learn more about what we do. What’s the Scope of Part 48 Again? Part 48 is the regulation for safety training at underground mines. Those of you reading closely may have noticed and perhaps been confused by the mention of surface mines in the quote from 48.1 above. To clear that up, here’s a second quote, this time from 48.21, which is the very beginning of subpart B. What Is an MSHA-approved Instructor for Part 48? The first mention of instructors in Part 48 comes up in 48.3. We’re going to quote this in length and then return to discuss smaller parts of it below. “(g) Except as provided in §48.7 (New task training of miners) and §48.11 (Hazard training) of this subpart A, all courses shall be conducted by MSHA approved instructors. (1) Instructors shall take an instructor’s training course conducted by the District Manager or given by persons designated by the District Manager to give such instruction; and instructors shall have satisfactorily completed a program of instruction approved by the Office of Educational Policy and Development, MSHA, in the subject matter to be taught. (2) Instructors may be designated by MSHA as approved instructors to teach specific courses based on written evidence of the instructors’ qualifications and teaching experience. (3) At the discretion of the District Manager, instructors may be designated by MSHA as approved instructors to teach specific courses based on the performance of the instructors while teaching classes monitored by MSHA. Operators shall indicate in the training plans submitted for approval whether they want to have instructors approved based on monitored performance. The District Manager shall consider such factors as the size of the mine, the number of employees, the mine safety record and remoteness from a training facility when determining whether instructor approval based on monitored performance is appropriate. (4) On the effective date of this subpart A, cooperative instructors who have been designated by MSHA to teach MSHA approved courses and who have taught such courses within the 24 months prior to the effective date of this subpart shall be considered approved instructors for such courses. Who Says if a Person Can Be an MSHA-approved Instructor for Part 48? The answer for this question is written in two different parts of the Part 48 regulation. So, with the exception of New Task Training and Hazard Training, MSHA Part 48 safety training can only be delivered by an MSHA-approved instructor, and you get that approval from the MSHA District Manager. Need to contact your district manager? Here’s a link to the various District Managers and their contact information. 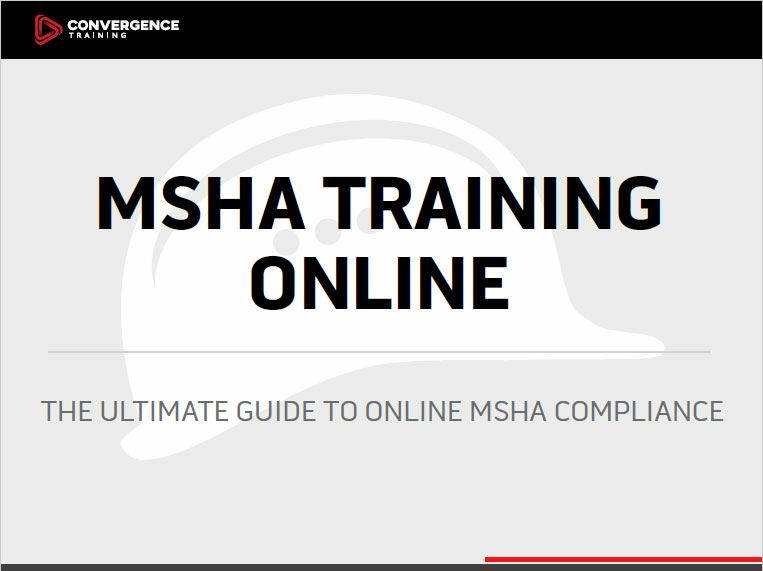 How Does One Get Approval from MSHA to Be an MSHA-approved Instructor for Part 48? Our recommendation is to find your district manager, contact that office, and find out exactly what their procedure, requirements, and expectations are. You may find that this answer varies from district to district. So, again, here’s that list of the contact information for MSHA district managers. That said, the regulation says you can do it in one of three ways. We’ve listed them below, quoting directly from the regulation [this is from 48.3(h)]. You can read additional information about this from a 2003 MSHA Handbook titled Education and Training Procedures. 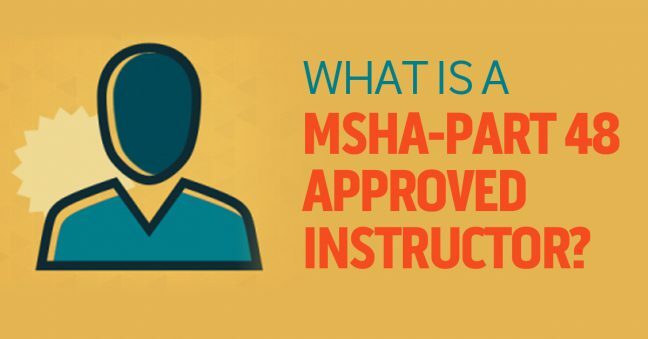 Information about getting MSHA approval is in section II. Information about revoking approval is in section III. We’ll be including some references from this MSHA Handbook in addition to the actual regulation as we continue this blog post. Now, let’s take a closer look at each of the ways mentioned above. “a. Inform the District, in writing, that they would like to attend the MSHA instructor training course and indicate which subject matter courses or programs they intend to teach. b. Submit information to the District prior to the instructor training course listing their mining experience, training experience and training completed. c. Satisfactorily complete the 3-day instructor training course conducted by MSHA. a. Make a determination of each applicant’s knowledge of the subject matter. b. Make a determination of each applicant’s teaching skills and qualifications. If you are approved, the Handbook says you’ll be notified ASAP. Also, you may have noticed the mention of an instructor complete system. You can find that here. You might have noticed that 48.3(h)(1) includes mention of becoming an MSHA-approved instructor after completing training “given by persons designated by the District Manager to give such instruction” in addition to getting the training from the MSHA district office as explained immediately above. a. Inform the instructor trainer, in writing, that they would like to attend the instructor training course and indicate which subject matter courses or programs they intend to teach. b. Submit information to the instructor trainer prior to the instructor training course describing their mining experience, training experience and training completed. c. Satisfactorily complete the MSHA approved instructor training course conducted by the instructor trainer. So this process is very much like the process of taking the training from MSHA described above. One tip: It’s still a good idea to touch base with your district office first before doing this. In a conversation with an MSHA district-level training specialist, I was told that the training provided by one state grant program didn’t match that district’s requirements. It may save you a headache later if you check in with the your district, explain your plans, and get feedback from them in advance. a. Submit an application to the District requesting approval to teach based on qualifications and teaching experience and include a list of the specific courses they intend to teach. b. Submit information to the District describing their mining experience, training experience and training completed. So you can get approval in this scenario without taking an instructor course. No doubt you’re experience and qualifications have to be impressive. “Districts may designate persons as provisional instructors to teach specific courses. Each such instructor is subject to follow-up approval based on the District’s monitoring of classroom performance. a. Indicate in the training plan submitted for approval whether they want to have instructors approved based on monitored performance. b. Submit in writing reasons why other approval methods would impose an extreme hardship. c. List the designated persons they will use to teach specific courses. These persons are provisional instructors until the District monitors them. a. Review reasons why other instructor approval methods would impose an extreme hardship. Determine the validity of the request and consider such factors as size of the mine, number of employees, mine safety record (accidents, fatalities, etc. ), and availability and accessibility of training. c. Inform the operator as soon as possible, in writing, of the approval. Enter the instructor’s credentials into the instructor computer system (refer to Chapter VI of this handbook). When the person is not approved, follow the procedures in Section B of this chapter. What is MSHA Looking For Before Granting Approval? They’re looking for evidence of your subject matter knowledge and your teaching skills. As explained in that MSHA Education and Training Procedures Handbook we’ve referred to repeatedly, here’s what they’re looking for. “The applicant’s work experience directly relates to the subject area. The applicant has MSHA and State qualification and certification. The applicant has completed MSHA approved courses. The applicant has related degrees from accredited institutions. The applicant has completed related classes at other institutions. Evaluation of micro-teaching sessions during the 3-day instructor training course. Work experiences that are similar to teaching experiences (e.g., safety meetings, on-the-job training, etc.). Standardized evaluation by the District during monitoring of the applicant’s classes in the field. Education degrees from accredited schools. Some people will be approved as instructors for all topics. Other will get ‘limited approval” that lets them lead training on some but not all topics. We’re probably going to write up an additional blog post that goes into this in more detail, so keep your eyes open for that in the future. Does MSHA Ever Deny/Withhold Approval? If that happens, you can always try again. But approval is not a slam-dunk you’ve got to know your stuff. “When an applicant is not approved based on evaluation by one of the four methods, the District sends notification to the applicant as soon as possible. This written notification must identify areas of deficiency or other reasons for disapproval. For example, the applicant did not attend the amount of required time during an instructor training class. The notification may also include how to correct the deficiency.” (see pp. II-4 and II-5)So, if this does happen, at least they’ll tell you why and let you know how to correct the problem. Does MSHA Ever Revoke a Previous Approval? Yep. They do this too from time to time. Let’s see how this is addressed in Part 48–48.3(i) , specifically. So if MSHA wants to do this, the District Manager has to send written reasons to the instructor, and the instructor then has a chance to “demonstrate or achieve compliance” on the matter. In addition, this can be appeal to the Administrator for Coal Mine Safety and Health or to the Administrator for Metal and Non-metal Safety and Health. The regulation lists one reason why approval may be revoked: “not teaching a course at least once every 24 months” (they want you to keep your knowledge and skills sharp). For much more detailed information about this process, see chapter III of the MSHA Education and Training Procedures Handbook. What Was That about Instructors for New Task Training and Hazard Awareness Training? So, let’s go check out 48.7 and 48.11 and see what that’s all about. So, MSHA-approved instructors CAN provide this training, but so can “a supervisor experienced in the assigned tasks, or other person experienced in the assigned tasks.” In short, you don’t have to be an approved instructor, but you DO have to have experience in the task. Not to criticize MSHA here, but there’s no specific reference to instructors in this section. We’re going to try to touch base with MSHA and get some clarification on this. You may want to talk with MSHA as well. If you think you’ve got the inside scoop on this, please leave a note in the comments section below. What are your experiences? Are you an MSHA-approved instructor? Was it difficult to become one? What was the class like? What are your subject matters? What do you enjoy about being an instructor? What is the hardest thing about it? And feel free to download the free guide below, too. Keith, yeah, there’s a bit of info there, but as you pointed out, it’s interesting and valuable stuff. Hope you enjoy the read and it proves worthwhile. Cheers. I have been an instructor for several years now. I enjoy it very much when i get the chance to teach and would love to do it for a living. Becoming qualified wasnt that bad unless you take into account the 15 years underground etc that went on my resume to get approved. Dan, I hear you. You’ve got to have a lot of hard-earned on-the-job experience to do it. We have two articles on topics related to this at our blog. Those two articles explain what you have to do to become a competent person and/or approved instruction for Parts 46 and 48. The next step would be contacting a mine operator (for Part 46) or contacting MSHA (for Part 48). For 48, you’d want to contact the district office. You can find their contact information here. Glad you found that helpful. What does the Instructor Code “CI-Dust Certification” qualify me to teach? I just recently went through my train the trainers class and only expected to get IS and IU, so i was wondering what this extra code was good for. Zach, a good question and one I don’t have an answer to. I’d recommend going write back to your trainer, and/or the MSHA district office, and asking them.